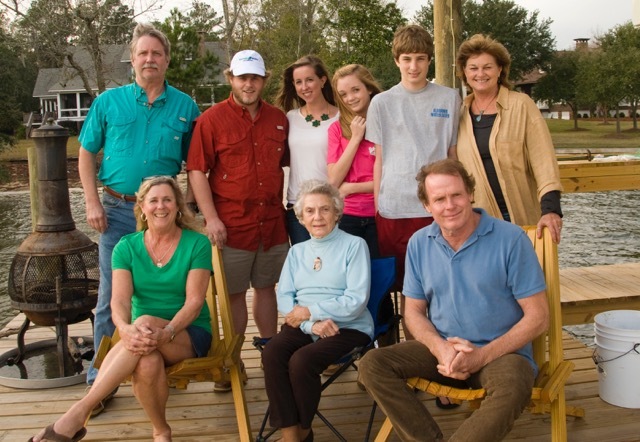 It is with deep regret that we must report that Charles A. Kelly is no longer with us. With the help of my brother John we were able to determine that Lt. Kelly, born on June 16, 1924 passed away on June 13, 1999. 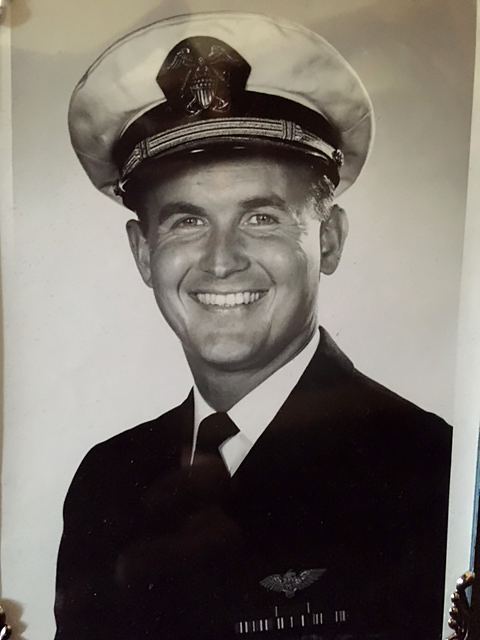 Lt. Kelly was a veteran of World War II and Korea serving as both a naval fighter and attack bomber pilot. 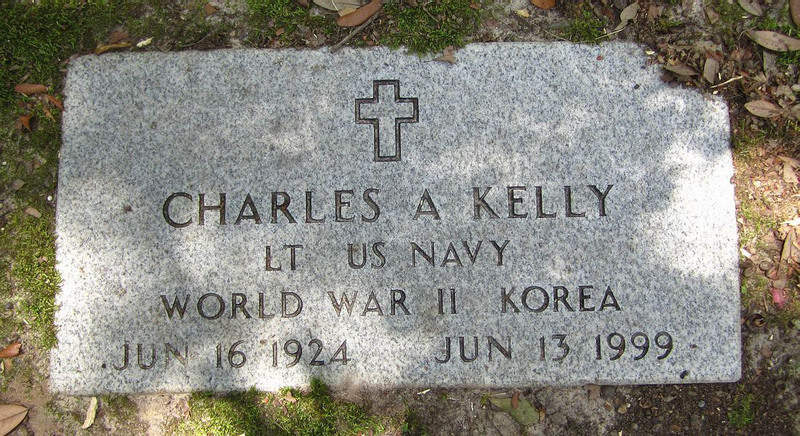 With the information from his headstone we were able to locate and speak to his son Charles A. Kelly, Jr. As a result we discovered that Lt. Kelly is survived by his 87 year old widow “Sissy,” his daughter Karen and four grandchildren, Kelly, Jimmy, Hannah and Charles A. Kelly, III. Both his son and his grandson, Charles III are avid scuba divers and have expressed an enthusiastic interest in diving the wreck site. The authors of this website would like to thank Lt. Kelly and his family for his service to our country in combat action, in two wars. 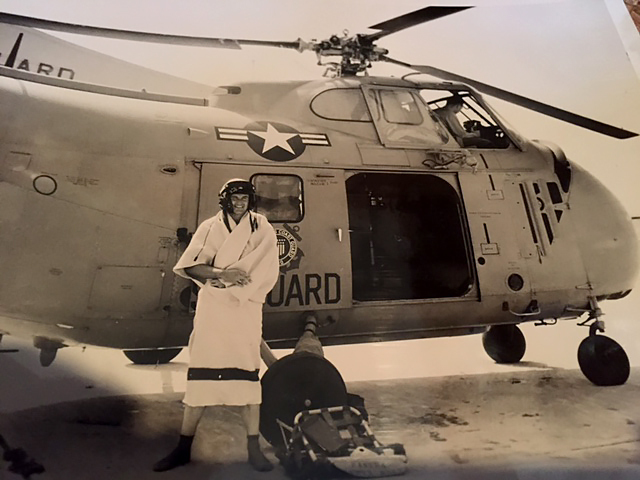 Even during “routine” training exercises, Lt. Kelly conducted himself according to the highest standards of a naval officer. The official “Incident Report,” published by the Navy reveals that Lt. Kelly chose not to return the stricken aircraft to its inland base so as to avoid a potential crash landing in a populated area of San Diego. The Lieutenant instead chose a riskier water landing to prevent loss of civilian life. What the report does not reveal is that at the time of the crash Lt. Kelly’s wife, Sissy, was 8 months pregnant with their daughter, Karen. 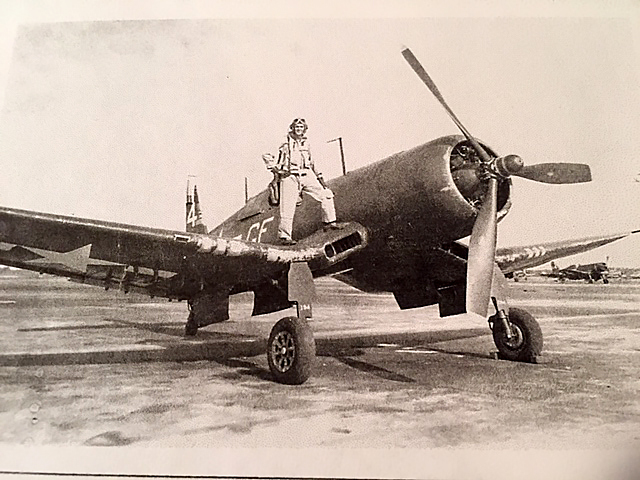 World War II, The 20 year old Lt. Kelly on His Corsair fighter Aircraft. 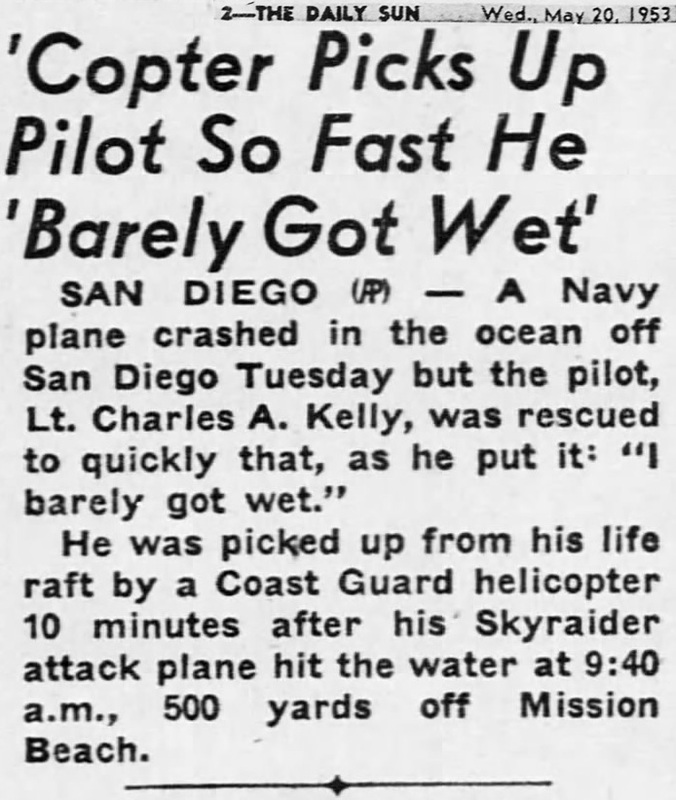 After the crash of his Skyraider, a local newspaper asked the modest pilot about his ordeal, which he minimized by stating… “I barely got wet.” The Incident Report also notes that, after an ordered medical examination, the stoic Lt. Kelly reported for duty later the same day. The “Barely Wet” Lt. Kelly immediately After his Rescue. We, as a nation, never forget to honor those lost in combat contemporaneously with their deaths, as their sacrifices are both ultimate and apparent. We would be remiss however, not to give credit where credit is due, when circumstance reminds us, to honor those that have completed their missions, returned to their homes, stood ready to serve again and expire anonymously decades after their duty has been done. Our reminder in this instance is the discovery of evidence of a selfless former WWII veteran pilot, who choses to take evasive action to land his malfunctioning aircraft in the ocean, in order to avoid injury to civilians, while training for yet another war. After the incident Kelly continued to serve as an active reserve attack bomber pilot for the durationn of the Korean conflict. Lt. Charles A. Kelly called to service in two wars was returned to us, without fanfare, unharmed to raise a family and continue his personal legacy. May we always remember the men and women of our armed forces, who serve without reward, whether they leave this earth, in war, or in peacetime, decades after their duty has been done. Let us be reminded by the artifacts of their bravery, of their service, of their passing and pause, for at least a moment, to honor their memory. The 60 year old wreckage of an aircraft, slowly deteriorating on the bottom of the ocean, may seem insignificant to some, but its real importance is as a tangible reminder of the life-threatening risks taken by the courageous members of our armed services in their preparation for, and service in, times of war.